Do you have a missing tooth or one that is discolored, damaged, chipped, misshapen or has a lot of dental work that might become infected? If so, you may want to consider getting a tooth crown or dental crowns. A tooth crown or dental crowns are a cap for your tooth that covers the damaged or misshapen tooth. 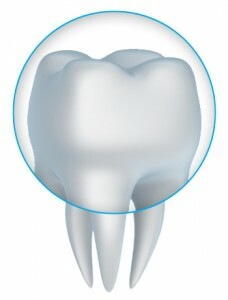 The process for placing a tooth crown or dental crown is one that can be accomplished usually in two appointments. In the first appointment, the dentist will take a mold of your mouth to then have the tooth crown or dental crowns custom made. When the tooth crown or dental crowns are ready, the dentist will prepare the original tooth by shaping it down, then bonding the tooth crown to the original tooth. The dental crowns are color matched to your original teeth so they look natural. A tooth crown can top a dental implant, which effectively replaces a missing tooth. A dental implant topped with a tooth crown is durable, comfortable, and aesthetically pleasing. Dental implants topped with dental crowns can also secure implant secured dentures, which are a solid, durable treatment if you have several missing teeth. Dental crowns one each side of a dental bridge or dentures secure these apparatuses properly. A tooth crown can make your mouth feel full and complete again. Dental crowns may aid in any speech impediments you may have as a result of having missing or severely damaged teeth. A tooth crown can keep your tooth from becoming more damaged, broken, or decayed. Dental crowns function like your original tooth. You can chew and eat naturally. A tooth crown can keep the rest of your teeth from shifting and can keep your bite in line and functioning properly. If you are interested to know more about dental crowns, call today!